I was trapped in an accessory store on a balmy Saturday evening. It was my last night in Istanbul. I had only a few hours to shop and eat doner kebabs one last time before going home to the States. Oh and sit in a Nargile cafe with a mint flavored hookah! But first some shopping!!! I was hunched over a basket full of tiny earrings on busy Istiklal street, trying to figure out if I wanted an owl or a lady bug for my second piercing on my ear, when I heard the store’s shutter coming down. I looked up and glanced over at my two companions who were also examining various accessories. We locked eyes. And went back to browsing. We could hear the protests outside the now closed store. Voices rising almost in chant-like. So we continued to browse. What else do you do when you are trapped inside a store?! I walk up to the counter to pay for my earrings and I ask the man behind the cashier what’s happening outside. And why today?! I thought the court had issued a stay on the park demolishment. The man just shakes his head and shrugs his shoulder. He rings up my items and I pay with Turkish Lira. My two girlfriends and I then huddle and strategize over the best course of action. Should we continue to shop when the shutter lifts?? The protests had started out over the intended demolishment of a park in Taksim Square. But just a few days earlier, the court had issued a stay and we had hoped we had heard the last of the protesters. These protests were often followed by tear gas from the police as the government sought to squelch the uprising and quickly disperse the mob. Violation of human rights?? 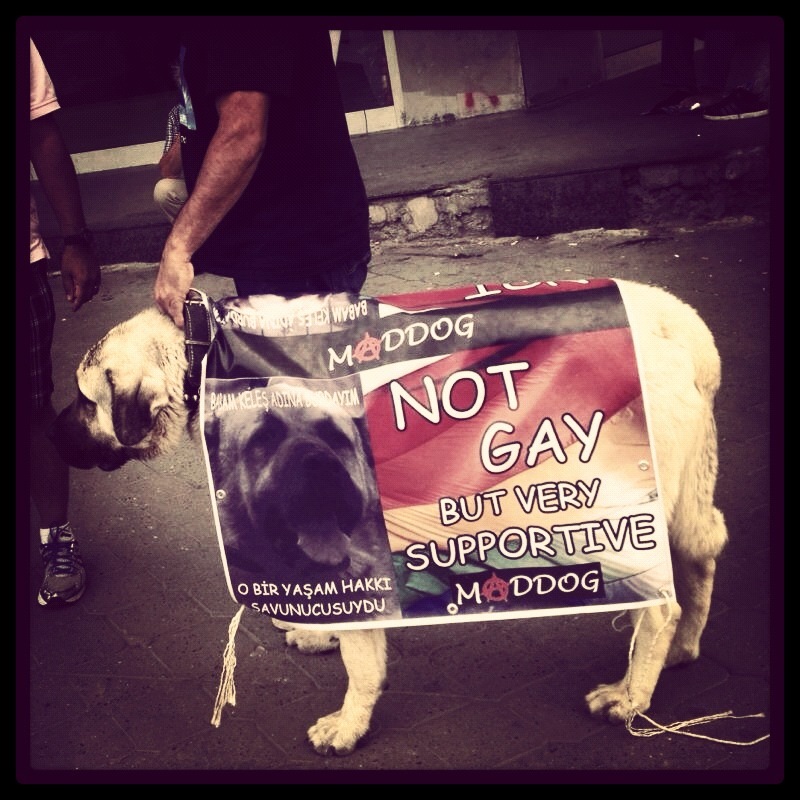 We even saw a dog with a cloth draped over it that read: I’m not Gay but I fully support Gay rights. It seemed as though the people of Istanbul were fighting for more than just the park. The shutter opened up halfway only to slowly come back down. Hnmmm. I could feel the beginnings of fear creeping up in me. How long would we be here? Our flight was in less than 8 hours. Where were the rest of our friends? What if something had happened to one of them? Was the tear gas streaming into their eyes and lungs as I stood inside the store, browsing for a lady bug and an owl earring? I shook off these questions and tried asking another dude loitering around, what the protests were about. A young woman then turned to me and said in a British accent that while the court had issued the stay order, thus allowing the people to enter the park, the Governor deemed entry as illegal and had ordered police intervention. The voices outside were feeble. I couldn’t hear anything. The shutters were going up again. We gingerly stepped out. We saw protesters rushing towards us on the left and more people running toward us from the right. The roads were slick with water – probably from the water canons? That meant the tear gas could be next. No more shopping. Those colorful sandals I had spotted two stores down would have to wait. Damn. We ran toward our hostel, zig-zagging through an alley, slowing only to avoid the watery puddles, and few minutes later arrived at our hostel. We banged on the hostel door to let us in and while we were waiting for the door to open, my throat started to clog up and eyes started to water. I guess the police were using the tear gas. I ran to the bathroom and splashed some water over my face. 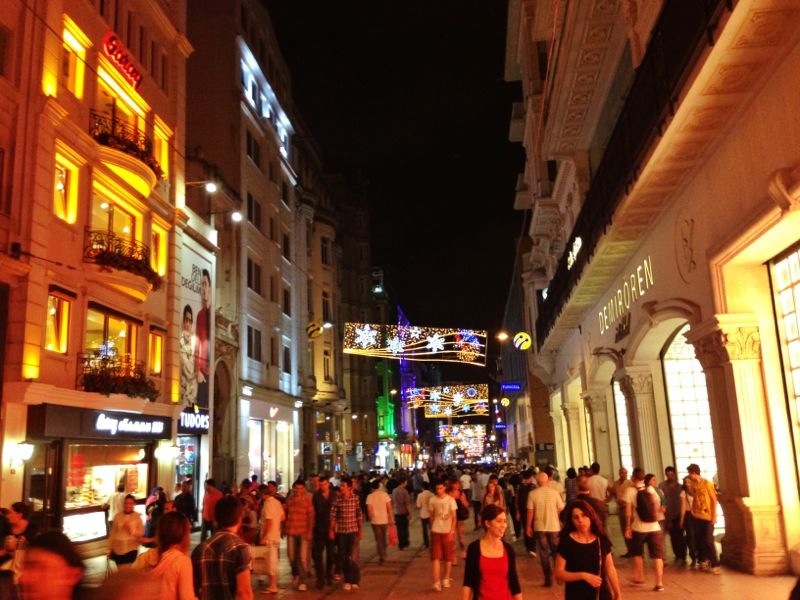 We then watched the tv screen in the main lounge in growing horror as we saw a man running around Istiklal street with a big flat steel knife. He hit a woman with the knife and kicked her once as she escaped him. The video played incessantly on repeat as we watched trying to make head or tail of what the reporter was saying. Is this what it takes to stand up for something you believe in? I felt a certain admiration for the protesters. A family with a young girl trudged in through the hostel door and sat down. The little girl swung her legs up and down, while dad was on the phone. Mom seemed calm. They seemed used to this routine. I asked him if he was visiting and he said he lived in Istanbul and had been shopping on Istiklal when the protests broke out. He was taking refuge in the hostel until it was safe to step out again. He had an almost nonchalant attitude. The locals were used to this, I realized. While some were active protesters fighting for their rights, others went about their daily lives, taking refuge as needed. We were starving now. The hostel wasn’t offering any food at this point. 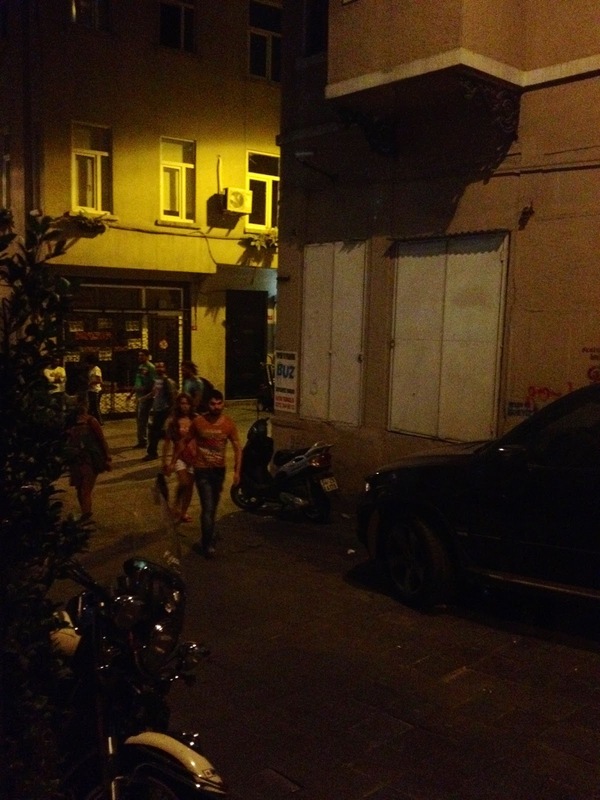 Two of our friends bravely attempted to head out to a nearby doner kebab stall, just as some protesters from the street stormed into our hostel with gas masks on. One elderly gentleman didn’t have a mask and he came in wheezing, the tear gas affecting his eyes and throat. We took him to the bathroom, while one of the regulars at the hostel gave him milk to wash his eyes out. She explained milk helps alleviate the burning from the gas. For a democratic country, I thought it odd that people are not able to peacefully protest the park issue. On the other hand, how does a government address a growing crowd that takes to the streets every week, causing disruption to businesses, especially tourism? Did the Turkish people have legitimate reasons to protest or were these troublemakers? I did not get my answer in the few days I was in Istanbul. Our friends finally stepped out and we waited in breathless anticipation – both for their safe return and for some food. They shortly returned with yummy kebabs that we devoured in minutes. We soon hit the sack, hoping that the protests would have died down by 4 am and that we could safely walk outside to take our cab to the airport. We hoped the man with the steel knife had stopped running around like a lunatic, hitting people. We hoped that no one was seriously injured in today’s protests. I drifted off to sleep dreaming of owls and steel knives. Early morning, as we come down the stairs into the road, the hostel manager, Orkun is there to greet us with his usual calm, resigned manner. He smiles. The Cheeky nightclub next door is back in operation and we can hear loud music thumping from inside. 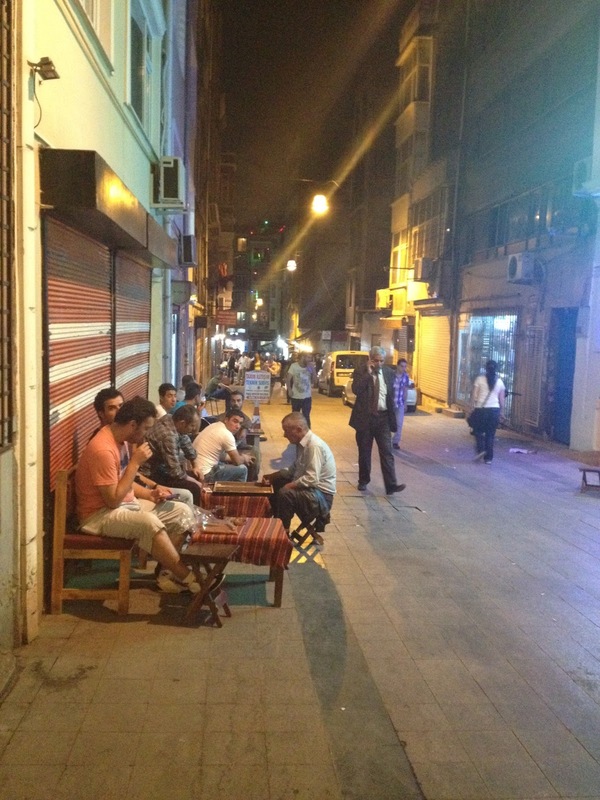 We walk around the corner to get into our cab and I catch a glimpse of people huddled around a small table on the road and playing some game. Across from them another group of elderly men were playing cards. As I come into view, they stop and stare briefly before going back to their game. I click a pic. Everything seems normal. Two girls in short skirts and cross body bags walk past me. Either getting ready for more Sunday protests or heading back home from a nightclub. Our taxi leaves the hostel and is soon speeding along the highway, the Marmara Sea to our left as we race toward the international airport. 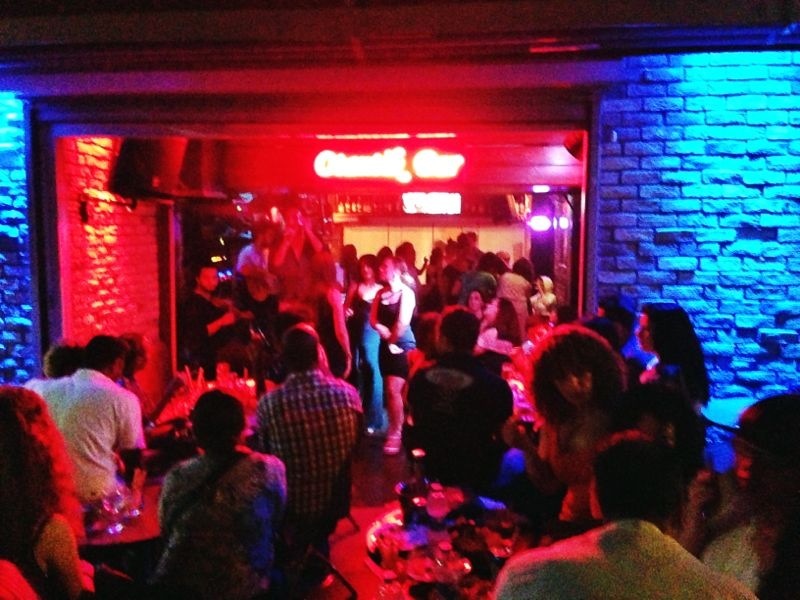 Who knows what Sunday will bring to Taksim Square and Istiklal street. I hope the people and the government come to a resolution quickly – one that is favorable for all. I want travelers to visit Istanbul and see what I saw and experienced – warm people, an exotic, vibrant city, that is both modern yet traditional with much to offer a traveler looking to explore. Have any of you recently visited Istanbul during this recent period of unrest? What was your experience like? Next postTop 5 Lessons I have learnt while traveling!